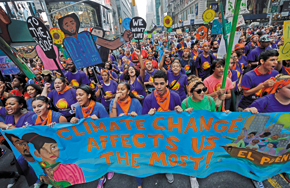 From the huge climate march in September to racial-justice activism, it was a year that saw renewal of movement-based politics. This last year was a tough one, with too many setbacks and too many reasons for justified anger. Yet we also saw inspired activism and the renewal of a movement-based politics of protest. There were stalwarts who battled economic inequality and racial injustice, who developed new ideas and new strategies. They deserve recognition—not as the only heroes of 2014, but as examples of what progressives can accomplish even in difficult times, and of what they will accomplish in the years to come. 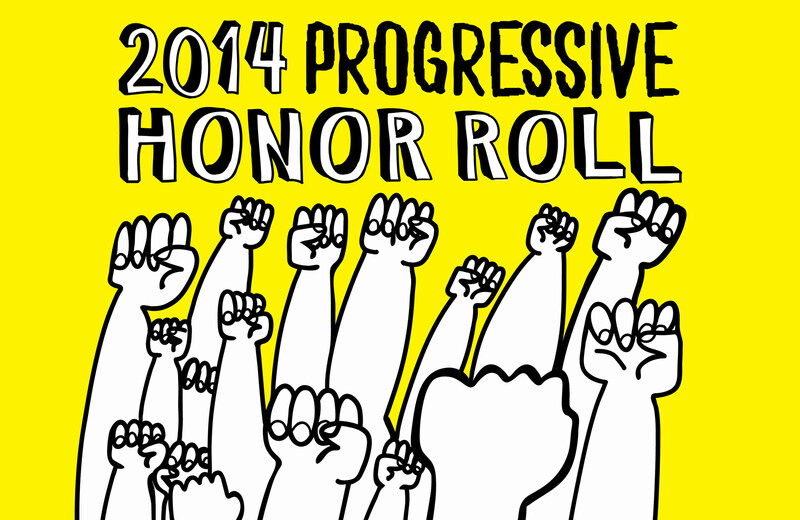 Here, then, is The Nation’s 2014 Honor Roll. No state sends a more solidly progressive delegation to Congress than Vermont. Senator Bernie Sanders champions economic justice. Representative Peter Welch works to reform foreign policy by ending wars and embracing diplomacy. And Senator Leahy, the senior member of the chamber, led fight after fight in 2014 to get big things done in a dysfunctional Capitol. He earned headlines late in 2014 when behind-the-scenes work (along with Senate staffer Tim Rieser) helped pave the way for normalization of relations with Cuba. And even Republicans recognized his effectiveness as chairman of the Senate Judiciary Committee, where he worked diligently—and with considerable success—to confirm judicial nominees, protect civil liberties, tackle human trafficking and address mass incarceration. The latter struggle is a passion for former prosecutor Leahy, who says, “Our criminal-justice system incarcerates too many individuals, especially nonviolent drug offenders, because of its reliance on mandatory-minimum sentences. And there continues to be distrust between law enforcement and communities of color because of a long history of unfair treatment towards minorities.” Losing Leahy as Judiciary chair will be hard, but his continued service as the committee’s ranking Democrat in the new Senate will be vital. He knows how to build unexpected coalitions: Texas Republican John Cornyn co-sponsored his legislation to strengthen the Freedom of Information Act. As a senior Democrat, Leahy does not pick the fights he sometimes should with his party’s leadership; he is not a firebrand. Yet this senator understands what battles must be waged, and he pursues them with a determination that will be more necessary than ever in 2015. 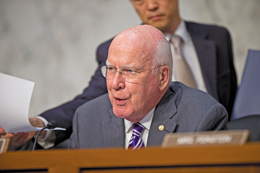 “I have fought the status quo every step of the way in these efforts,” Leahy said in November, when his plan to reform surveillance laws fell just two votes short of breaking a filibuster. Leahy is ready (and uniquely well positioned) to keep fighting—and changing—the status quo the next Congress. Yes, it’s great to win elections. But often the most important campaigns are those that fall short in the battle for votes but win the battle of ideas. Fordham law professor Zephyr Teachout did that when she mounted an audacious challenge to New York Governor Andrew Cuomo, first for the nomination of the Working Families Party and then in the Democratic primary. Teachout campaigned against corruption—the focus of her excellent new book, Corruption in America: From Benjamin Franklin’s Snuff Box to Citizens United—and for campaign-finance reform. 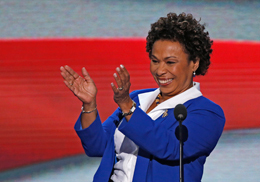 She also tackled the concerns that are neglected when money controls politics, such as fracking, high-stakes testing and educational reform, and the need for a “New York Is Home” Act to protect immigrant rights. Despite Cuomo’s attempts to knock her off the primary ballot, his refusal to debate and his free-spending incumbent’s campaign, Teachout secured a third of the vote and carried more than two dozen counties. That wake-up call for compromising Democrats was reinforced by the fall campaign of the Green Party’s Howie Hawkins. Cuomo got at least some of the message: by December, he moved to ban fracking. The first step in holding politicians to account is to challenge them. Primaries are healthy, especially in a Democratic Party where too many leading figures are prone to compromise and too many messages are muddled. Teachout added clarity to the competition, and she provided a model for merging activism with electoral politics. Democrats lost the governorship of Massachusetts in November, but their candidate for attorney general won by nearly 500,000 votes—not bad for an electoral newcomer who will be the first openly lesbian attorney general in American history. Healey entered the race for the top law-enforcement job as a former deputy state attorney general with a track record of fighting for civil rights—spearheading Massachusetts’ successful challenge to the Defense of Marriage Act—and taking on big banks. “The big guys have plenty of lawyers,” Healey announced. “The attorney general’s job is to fight for the rest of us.” Will Healey beat the big guys? Bet on it: before she became a lawyer, she was the five-foot-four starting point guard on a professional basketball team. “As many as 400,000 people turned out in New York City on Sunday for the People’s Climate March. The turnout far exceeded expectations,” announced Democracy Now’s Amy Goodman. “It was the largest climate-change rally in history,” declared MSNBC’s Ed Schultz. And that was just in New York. There were 2,646 solidarity events in 162 countries. Give 350.org credit for having the foresight to call the march on the eve of the UN Climate Summit. Give Nation columnist Naomi Klein credit for framing the debate by spinning arguments she raised in her 2011 article “Capitalism vs. the Climate” into a brilliant and brilliantly timed book, This Changes Everything. Give the Sierra Club and Friends of the Earth credit for seizing the opportunity to expand the scope and demand of traditional environmental activism. It worked—not as the end of anything, but as the beginning of a new wave of climate activism. Making the minimum wage a living wage is vital, but that’s not the only concern for retail and restaurant workers. “Erratic, constantly changing schedules aren’t just a nightmare for workers, they’re bad for business,” says national Jobs With Justice executive director Sarita Gupta, who points to the crying need to “adopt twenty-first-century policies that keep up with the changing nature of today’s workplace.” JWJ has begun campaigning for a Retail Workers Bill of Rights that guarantees steady schedules, respects part-time workers and opens options for full-time work. The San Francisco Board of Supervisors approved a measure in November, and other communities are taking up the cause. With the fury over the deaths of Michael Brown in Ferguson and Eric Garner on Staten Island, a new age of protest emerged, and so too did groups that make old demands in new ways: for police accountability, for an end to mass incarceration, for racial and economic justice. In Missouri, groups like Millennial Activists United and Hands Up United stepped up in Ferguson. After a grand jury’s failure to indict in the Garner case, Justice League NYC (a project with roots in singer Harry Belafonte’s Gathering for Justice initiative) expanded its work on behalf of criminal-justice reform to play a coordinating role in organizing protests. They weren’t the only groups trying new approaches and forging fresh alliances in those communities; and those communities weren’t the only places where activists made connections that have the potential to be transformational. That was evident in Richmond, California, where police chief Chris Magnus held a “#BlackLivesMatter” sign as he joined local young people at a mid-December protest. And it was evident in cities across the country on December 4, as striking fast-food workers integrated cries of “I can’t breathe!” with their call for living wages. Campaigns that began at the local level are adding a sense of urgency to the national discourse. After Millennial Activists United co-founder Ashley Yates met with President Obama, she explained, “We have been on the ground making the changes that we can in our community, but these are high-level changes that we need to see. These are systemic issues, and we need systemic solutions for them.” She’s right. Forget the stack of books written by politicians who might be running for president. Historian Harvey Kaye’s examination of Franklin Roosevelt’s 1941 definition of what World War II and its aftermath would be about—a fight for freedom of speech and religion but also for freedom from want and from fear—speaks directly to the current necessity that America be made more free, more equal and more democratic. Like the remarkable Louis Kahn–designed Franklin D. Roosevelt Four Freedoms Park on New York’s Roosevelt Island, Kaye’s book provides an inspired reminder: we have done it before. We need to do it again. In dozens of communities across the country, progressives start their day with this provocative, newsy show from Washington, DC, which goes all-in on politics. Press, a former aide to Jerry Brown who used to spar on CNN’s Crossfire, is a knowing host (the author of savvy books on talk-radio and spin) and enough of an insider to ask the right questions of the House members and senators who wake up early to join him and his young crew in their Capitol Hill studio. Yet Press is enough of an unreconstructed liberal that he is comfortable calling out Democrats, including President Obama, when they are wrong—especially on questions of civil liberties and war and peace. It’s not easy to host a three-hour radio show during the day and then host a nightly television program, while writing important books on economic meltdowns. But Thom Hartmann does it every day and with remarkable grace. Hartmann has a radical sensibility; he takes conversations further than most hosts. He rejects horse-race electoral coverage and DC gossip in favor of serious conversations about food safety, busting up big banks, and developing a just and sustainable economy. Hartmann is gracious, but he does not suffer fools gladly, which may explain why his one steady political guest is Senator Bernie Sanders. 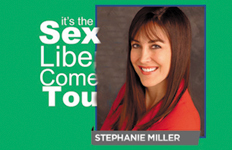 When talk-radio host Stephanie Miller and her crew of comedians, satirists and always-aghast social commentators leave their LA studio and hit the road, two things happen. Theaters sell out, especially in communities where Miller’s show is a bastion of social liberalism on an increasingly right-wing radio dial. And crowds find out how much comedy, and outrage, are still too edgy for the airwaves. Miller—the daughter of William E. Miller, the GOP’s vice-presidential candidate in 1964—makes a convincing case that neither Barry Goldwater nor her father would accept the extremism of what she decries as “not your father’s Republican Party.” And as he wrestles with the hypocrisy of the religious right, comedian John Fugelsang offers up the most iconoclastic and compelling case to be made for a religious left. The Comedy Central stalwart started his show last April and immediately rewrote the script for how serious a satire program can get about exploring—and challenging—everything from the Obama administration’s drone policy (“When children from other countries are telling us that we’ve made them fear the sky, it might be time to ask some hard questions”) to the “depressingly unambitious” efforts of regional and global leaders to promote peace in the Middle East. Oliver is most effective at exposing the absolute corruption of the American political process. Aided by a staff that knows politics and reaches out to the Center for Public Integrity and other watchdog groups, he did a better job this fall than network anchors when it came to explaining how cable companies are trying to gut net neutrality (“These companies have Washington in their pockets to a conveniently almost unbelievable degree…. They are practically overseeing their own oversight”) and how big money is buying up state legislatures (“Whilst most people may ignore these bodies, corporations don’t”). That latter segment took on the shadowy, corporate-funded American Legislative Exchange Council, the “conservative bill mill which has helped develop model legislation from Arizona’s notorious SB 1070 immigration bill, to bills expanding private prisons, payday-loan companies and for-profit colleges—all of which we have talked about on this very show.” Oliver says he is going to list ALEC as his “associate producer for creating horrifying things for us to talk about.” This is funny, profound and required viewing. 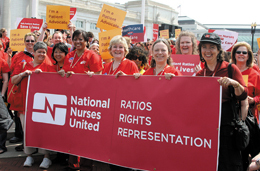 Whether its members are forcing the implementation of model standards for responding to Ebola, fighting for water rights in Detroit, campaigning for a “Robin Hood” tax on financial transactions, or organizing nurses in some of the most anti-union states in the country, NNU practices a fearless social unionism that gets results. Long before most Americans began to worry about Ebola, NNU executive director RoseAnn DeMoro, Registered Nurse Response Network director Bonnie Castillo and other union leaders were demanding that the United States rush aid to West Africa, and warning that American hospitals were “woefully” unprepared for what was to come. NNU helped remake the national debate about that public-health threat. And it helped remake the debate in Detroit, where, under pressure from a Republican-imposed “emergency manager” regime, the water department began shutting off service to low-income families who couldn’t pay. Working with the Michigan Nurses Association, NNU sent organizers into Detroit to join forces with the Michigan Welfare Rights Organization and other local groups. On a Friday in late July, NNU activists rallied with Representative John Conyers and actor and water-rights activist Mark Ruffalo against the shutoffs. On the following Monday, they were temporarily suspended. That wasn’t the end of the fight, by any means. But it put a neglected public-health issue on the front burner—something NNU is very good at doing. At a time when organized labor has faced an unrelenting assault nationwide, the Los Angeles County Federation of Labor has gone from strength to strength under Durazo’s leadership. The veteran secretary-treasurer of the federation of unions representing 600,000 workers is credited by the Los Angeles Times with having “lifted an already strong [LA] labor movement to a preeminent position of influence in civic affairs.” She’s done so by embracing every avenue of working-class struggle: organizing, bargaining, electioneering and, above all, coalition building. As the Seattle City Council took steps in 2014 to begin implementing a $15-an-hour minimum wage, Durazo and her allies secured passage of a requirement that Los Angeles’s largest hotels pay workers at least $15.37 an hour. That sort of success attracts attention, so it’s no surprise that Durazo has moved to a new position as general vice president for immigration, civil rights and diversity at UNITE/HERE, the hotel and restaurant workers’ union she once served as a local union head.